Did you grow up in a family of musicians? I started playing the cornet when I was six years old. At home. My Dad showed me how to get started, how to produce a sound, and he wrote down a C-major scale with the appropriate fingerings. It wasn’t until I entered the conservatory, when I was fourteen, that I started to take the trumpet more seriously. Prior to that, the cornet was my main instrument. Next to trumpet, cornet, and flugelhorn, I also play natural trumpet, and I double on alto/tenor horn and trombone. Baroque, classical, brassband, pop, funk, jazz. Do you think trumpet playing is difficult? I used to think it was easy. After two failed attempts to change my embouchure at the conservatory, several dystonia type symptoms, and many years of hard work to recover, well, let’s say I gained a different perspective. It can be very easy, but it can also be very difficult. Practice! Certain things, however, can only be learned by actual playing experience. Do you do any yoga or other stuff to stay in shape or to get better? Meditation and certain yoga- and breathing exercises are part of my daily routine, but not necessarily because of the trumpet. For me, they just seem like sensible things to do in order to live a balanced life. Your body needs daily attention, but so does your soul. Do you practice a lot? Everyday? I actually like to practice, so I try to do so every day. I mostly use Jeff Smiley’s book, The Balanced Embouchure (BE), as far as embouchure development goes. In my opinion, it’s the best book out there. Other than that, Arban, Clarke, etudes, things like that. Or I work on some chord changes, play along with Aebersold, or I practice parts for an orchestra or band. Who is your favourite trumpet player? I don’t really have one favourite, as there are so many, but the first trumpet player that I really loved, was Harry James. My Dad had some of his records, and as a kid, I used to listen to his music before going to sleep. Another trumpet player who has been important to me, is Chet Baker. It is because of his music that I first became interested in learning improvisation. 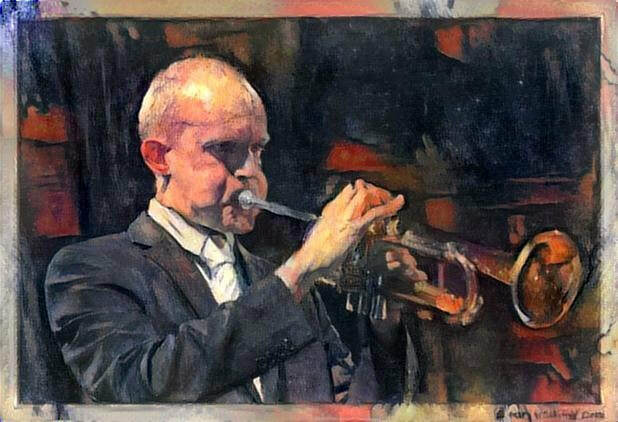 Eric Vloeimans, whom I’ve had the privilege and pleasure to study with, is yet another trumpet player that I greatly admire and love. Finally, I would have to mention Niklas Eklund, a baroque trumpet player. While still in highschool, I bought one of his CD’s. I had never heard of him, nor had I ever heard a baroque trumpet. I was simply blown away. So beautiful! That’s when I decided that I also wanted to learn how to play the natural trumpet. What would you recommend people that just start playing the trumpet? It was a very pleasant afternoon. We got along well and time passed without noticing it. I think the BE lesson went well too. Let’s stay in touch!